Iron gall ink is one of the most frequently found inks in manuscripts from the Middle Ages to the 19th century. With a color ranging from blue-black when freshly made to a rusty brown when degraded, it is omnipresent in libraries and archives, and was often referred to as “common ink”. Historically, iron gall was “homemade” until around the 18th century, when commercial production started. Iron gall ink was not used exclusively for writing: several well-known artists used it to make exquisite drawings (Rembrandt, Van Gogh and Victor Hugo, to name a few). According to James (4), the first specific mention of drawing with iron gall ink was made in the late 17th century, but some authors believe that artists of the Early Renaissance were already using the ink. Unfortunately, with its inherent corrosive action on paper and parchment, the iron gall ink used in so many drawings and historical documents has been creating serious preservation challenges for many institutions around the world. A great deal of research has been done in the last 25 years and a successful treatment using phytic acid was developed in the Netherlands in the 1990s. The treatment of iron gall ink still remains controversial, however, and research to better understand its chemistry and possible treatment is still ongoing. Gall nuts are spherical growths found on oak trees. Their development is triggered when insects puncture tree branches and twigs where they then deposit their eggs. When the larvae hatch, they feed on the tree and secrete an irritant. Galls are the plant’s defense mechanism. As they grow, they provide shelter and food to the larvae until they reach maturity and are able to chew their way out. According to Cardon (1), to preserve as much of the tannin as possible, galls were harvested preferably before the insect had become an adult and made its way out. At this stage the galls are referred to as ‘blue galls’. They are small, heavy, and dark in color. ‘White galls’, gathered just before or after the insect has escaped, are bigger, lighter in weight and color, and contain fewer tannins. The holes through which the insects escaped are generally clearly visible. 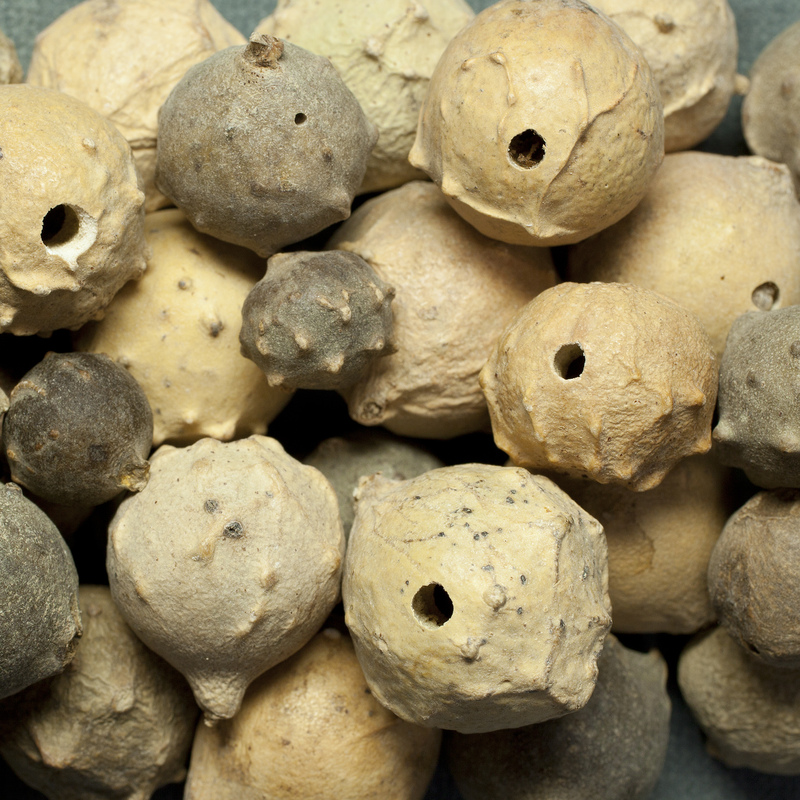 Gall nuts with escape holes. When making iron gall ink, gall nuts are used as a source of tannin. Tannins are complex organic molecules known as polyphenols that can be extracted from various parts of plants such as bark, leaves, pods, fruits, and gall nuts. Tannins have been used for thousands of years in the tanning of leather and dyeing of textiles. Gall nuts were the main source of black dye for silk in the Mediterranean and in Europe for many centuries. Daniels (2) mentions that one of the traditional ways of classifying tannins is whether the color obtained after the addition of iron salts is blue/black or green/brown. ‘Iron-blueing’ or ‘hydrolysable’ tannins contain large amounts of gallotannins which, through acid hydrolysis, will give gallic acid. It is the reaction of iron sulfate with gallic acid that creates the iron-tannin complex responsible for the dark, gray/black color of iron gall ink. ‘Iron-greening’ tannins, also called ‘condensed’ tannins, polymerize and oxidize through acid hydrolysis to form brown or green compounds in combination with iron salts. Inks made from these tannins tend to be less stable, quickly fading to a faint brown or rusty color. The extraction of tannins from gall nuts can be done in several ways: mixing, macerating, cooking, or fermenting. The amount of tannins extracted will vary according to the method used. It is generally thought that mixing with water will yield fewer tannins than macerating, macerating less than cooking, and cooking less than fermenting. It’s not unusual to have mold grow on the surface of a fermenting solution of gall nuts. This mold is said to promote the formation of gallic acid by releasing enzymes that encourage the hydrolysis of gallotannic acid into gallic acid. Using a slightly acidic solvent such as wine or beer is also said to enhance the production of gallic acid. Since the reaction of gallic acid with iron sulfate forms the black iron-tannin complex, the higher the amount of gallic acid, the better or more stable the ink will be because there will be more chances of gallic acid bonding with the iron (Dorning (3)). Two gall nut solutions left to macerate for 14 days. On the left, the gall nuts are in water and have developed mold at the surface. On the right, the gall nuts are soaking in white wine. Take 4 bottles of good wine, white or red, and 1 lb. of galls, slightly bruised, which must be put into the wine, and allowed to stand for 12 days, and be stirred every day with a stick. The twelfth day it must be strained through a strainer of fine linen, and must be poured into a clean jar, and put on the fire to get hot, until it almost boils. Then remove from the fire, and when it has cooled so as only to be tepid, put into it 4 oz. of gum-arabic, which must be very bright and clear, and stir it with a stick, then add ½ lb. Roman vitriol, and stir it continually with the stick, until all things are well incorporated together, and let it cool and keep for use. And note, that ink made with wine is good for writing books upon the sci­ences, because, when books are written with it, the letters do not fade, and can hardly be scraped out or discharged from parchment or paper. But if they are written with ink made with water, it is not so, for they can easily be scraped out, and it may happen that the letters written with it will fade. 4 bottles of wine, or water, or half of each. 1 pound of galls of xij. oz. to the pound. 4 oz. of gum Arabic. And if you took equal parts of each, galls, gum, and vitriol, as much of one as of the other, by weight, it would still be good; as for instance, 6 oz. of each, would be sufficient for the said 4 lbs. of wine or water, or wine and water mixed as before. 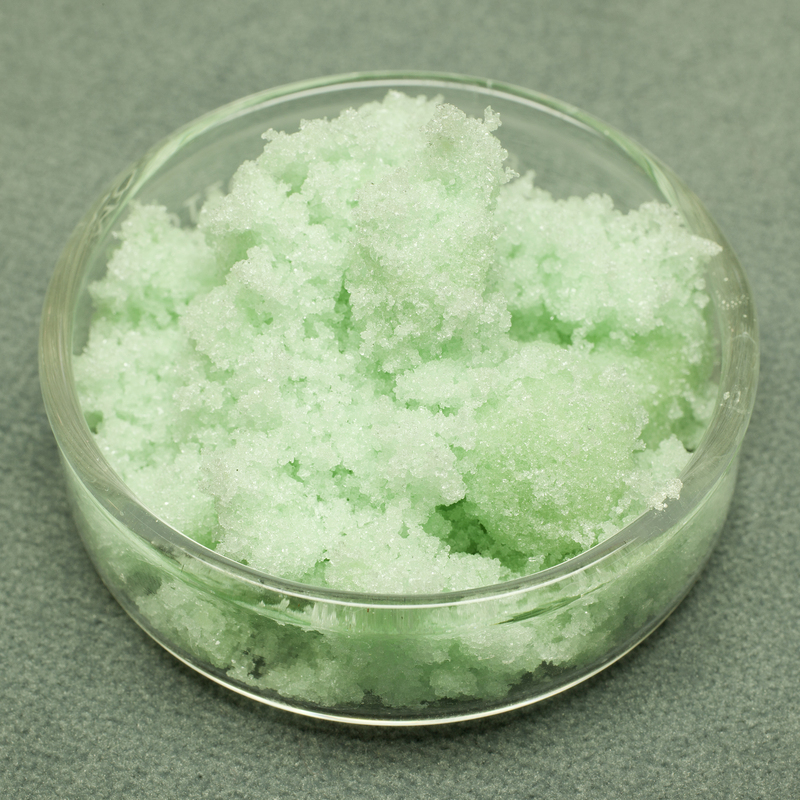 Green crystals of iron sulfate. Iron sulfate or ferrous sulfate (FeSO4•7H2O) is a metal salt that has been historically used as a mordant for textile and leather dyeing, and in the manufacture of mottled or tree calf during the 19th century. In literature and historical ink recipes it is often referred to as vitriol, green vitriol, copperas, green copperas, and Roman vitriol. The salt could be obtained from mines through various extraction techniques, by dissolving iron in sulfuric acid or as a by-product of alum manufacturing. Mined iron sulfate could contain a certain amount of impurities such as copper sulfate and zinc, while iron sulfate obtained from alum manufacturing could contain aluminum. Copper sulfate can be found as an ingredient in ink recipes either as an additive or a substitute for iron sulfate. Copper sulfate was also known as blue vitriol or blue copperas. Because they shared similar names and were closely associated, iron and copper sulfate were often confused. 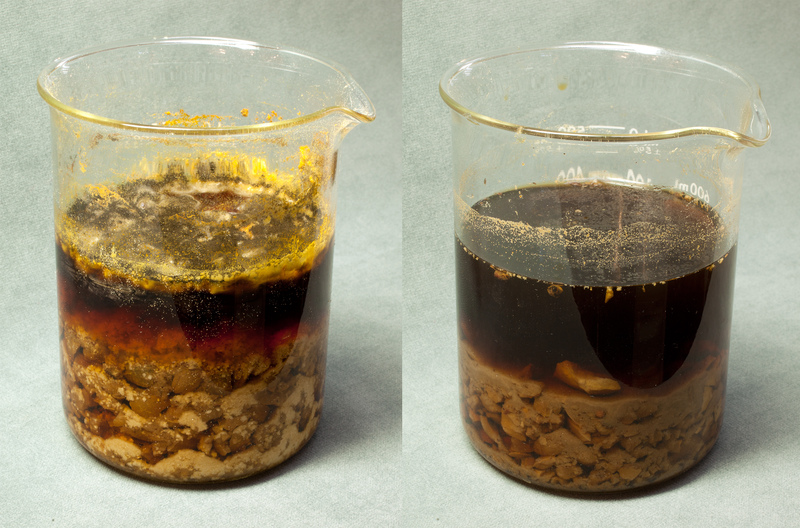 Used alone, copper sulfate mixed with gallic acid will give a soluble brown complex (Daniels (2) and Krekel (5)). 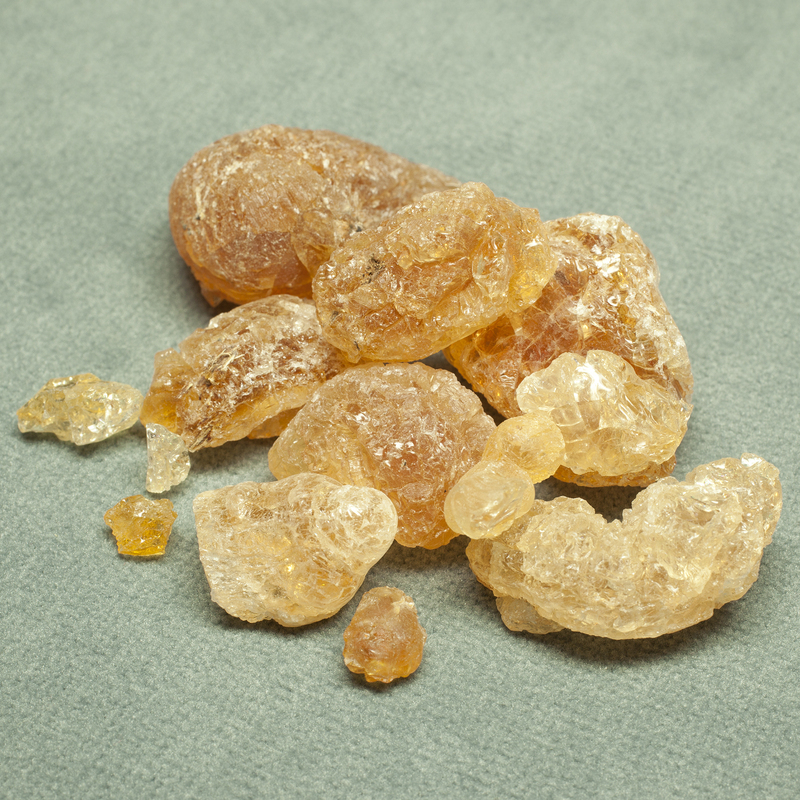 Gum arabic is a natural, water soluble gum that exudes from Acacia trees in Africa, India, and Australia. It has been used for hundreds of years as a binder in inks and paints, as well as a varnish for watercolors. It can be found as transparent lumps ranging in color from pale yellow to dark orange (almost brown). The lighter and clearer gum was generally favored, especially for painting. Once ground into a powder it has an off-white color. Local and cheaper sources like cherry gum or (starting in the 19th century) dextrin were often used as substitutes. Gum arabic serves many purposes in an ink: it makes the ink more viscous, improving its flow from the pen; it keeps insoluble pigment particles in suspension; it helps bind the ink to the writing surface; and it gives the ink’s color more brilliance and depth. preservatives such as alcohol, cloves, or vinegar (to prolong the shelf life of the ink). Below is an example of a recipe where pomegranate rind is added. Interestingly, because pomegranate has antioxidant properties, it has been suggested that its addition to ink might help make it less corrosive (Stinjman, 8). Raine water 3 gallons, of white wine vinegar a quart, gaules two pounds, gum arabeck one pound, pomegranate pills one quarter of a pound, all these bruised but not beat too small, copporus two ounces, this will be ready the sooner, if it stand near by the fire, or in the sun. As mentioned earlier, the reaction of gallic acid with iron sulfate forms an iron-tannin complex which gives iron gall ink its color (Dorning, 3). The reaction also produces sulfuric acid which remains in the ink. As the freshly applied ink dries, it reacts with atmospheric oxygen and the color of the ink develops and becomes darker, more blue-black: the water-soluble, colorless iron(II) gallate is oxidized into the insoluble, blue-black iron(III) gallate. This reaction can also occur as the ink sits in its container before it is used. Dorning (3) suggests that iron gall ink’s permanence is enhanced by applying it before it is oxidized into the iron(III) gallate complex. The logic is that if the oxidation process occurs when the ink has already sunk into the fibers of the support, the iron(III) gallate complex will be deposited within the paper fibers. If the ink is left to sit prior to its use, the oxidation occurs in the container, leading to the formation of a precipitate of fine black pigment particles. This precipitate risks diminishing the ink’s writing properties and tends to sit more on the surface of the fibers instead of sinking in. Therefore, when the ink is applied fresh, it is more akin to a dye; when it is applied after oxidation, it would be closer to a pigment suspended in a binder. 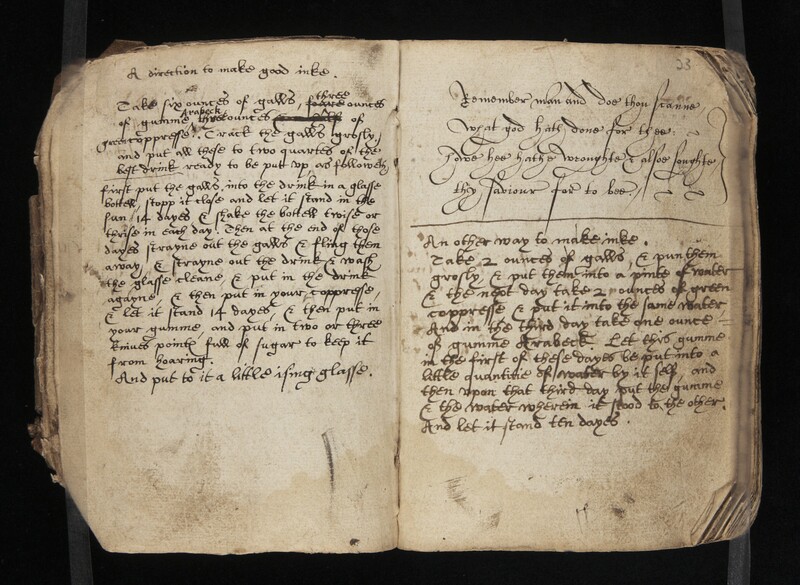 Several iron gall ink recipes, such as the one below, advised to let the ink rest before use. Here the ink is left to sit fourteen days after the addition of the iron sulfate. Notice the use of sugar and isinglass* as additives: the sugar as a plasticizing agent and the isinglass perhaps to impart extra gloss or more binding power. A direction to make good inke. Take six ounces of galls, three ounces of gumme Arabeck, three ounces of green coppresse. Crack the galls grosly and put all these to two quartes of the best drink ready to be put up, as followeth. First put the galls into the drink in a glasse bottell, stop it close and let it stand in the sun 14 dayes, & shake the bottell twice ot thrice in each day. Then at the end of those dayes strayne out the galls & fling them away, & strayne out the drink & wash the glass cleane, & put in the drink agayne, & then put in your coppresse, and let it stand 14 dayes, & then put in you gumme, and put in two or three knives pointe full of sugar to keep it from hoaring . In the last 20 years or so, a tremendous amount of resources and research has been poured into understanding and treating iron gall ink corrosion. Iron gall ink corrosion is the result of two different degradation processes that interact and feed off each other: acid hydrolysis and iron-catalyzed oxidation. According to Banik (10), the more destructive of the two reactions is the iron-catalyzed oxidation. A 16th century manuscript with severe ink corrosion. These reactions are strongly influenced by natural ageing, storage, temperature, and relative humidity. Reissland (7) notes that two other often overlooked factors also have an impact on the amount of damage caused by ink corrosion: the amount of ink applied and the sizing of a paper. A thick line of ink is likely to cause more damage than a thin line as it leaves more surface area of the support vulnerable to corrosion. In the same way, a paper with little or no sizing will more readily absorb ink into its fibers than a hard-sized paper, where the ink will tend to sit on the surface. The inherent alkaline nature of parchment and the presence of alkaline fillers in paper will also play a significant role in slowing down the degradation from ink corrosion. As pointed out earlier, the manufacture of iron gall ink is accompanied by the release of sulfuric acid: the pH values of iron gall ink are typically between 1 and 3. This acid can easily migrate through paper, attacking and altering the cellulose chains as well as the ink complex. With time, the paper becomes more and more brittle and the ink takes on a brown color. The mechanisms by which the black ink complex turns to brown are still not well understood but acid hydrolysis of the ink complex has been suggested as one of the possibilities. 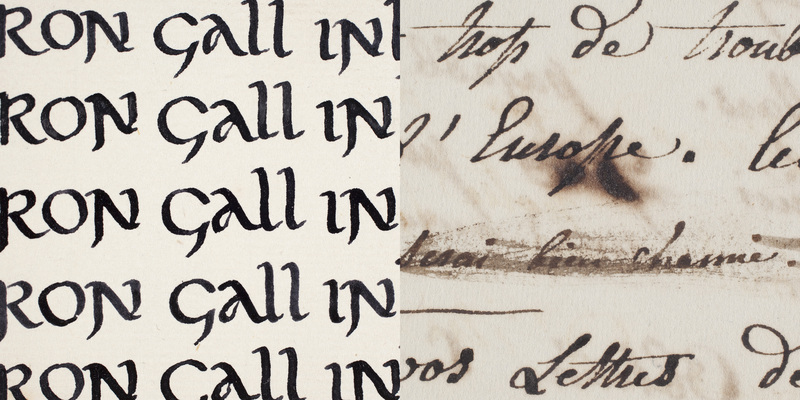 On the left freshly made ink; on the right, a 19th century letter. Iron-catalyzed oxidation can be caused by excess iron in the ink formulation as well as by the presence of other transition metals such as copper or zinc (impurities in the iron sulfate) or, in the case of copper, the deliberate addition of copper sulfate. Research has shown that there is an ideal ratio of iron to tannin to make a stable ink (1:3.6 iron : tannin); however this can be very hard to control when starting from natural materials where the exact quantities of tannins and iron are unknown. The excess iron, generally present in a Fe+2 state of oxidation, acts as a catalyst in initiating a redox-reaction (Fe+2 is oxidized to Fe+3 then reduced, and so on) which results in the oxidation and slow breakdown of the cellulose. The support goes through various stages of degradation: discoloration, crosslinking**, brittleness, formation of cracks in ink lines, and finally loss of substrate in ink lines. 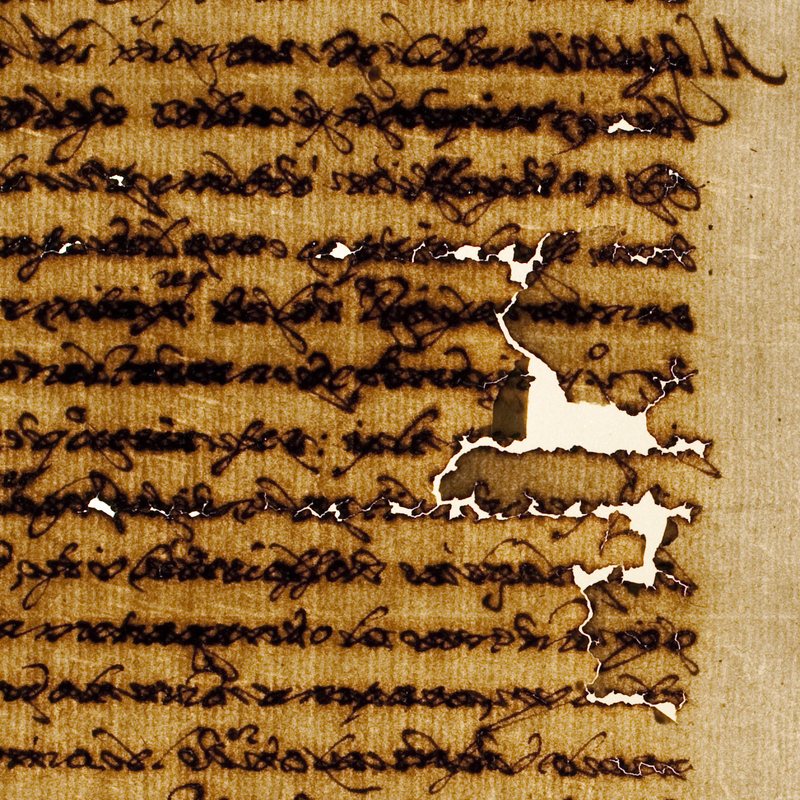 Unlike acid hydrolysis, caused by the mobility of sulfuric acid throughout the paper, damage caused by iron-catalyzed oxidation tends to stay close to the inked areas. Iron gall corrosion has not been a problem limited to paper. During the Middle Ages, iron gall dyes were known to degrade silk and other fibers. In fact, in the late 15th century, the Doge of Venice prohibited dyers of woolen cloth from using all tannins and iron mordants (iron gall black dyes) in the dyeing of textiles. However, across Europe, iron gall dyes were tolerated on the condition that they were applied on a ground of woad of the appropriate intensity. By applying the dye to a blue ground instead of a white ground, the amount of iron sulfate needed to achieve a good color and the potential for corrosion were decreased. (Cardon, 1). For a more in-depth look at iron gall ink and iron gall ink corrosion, please consult the Ink Corrosion website and the references below. * Isinglass is an adhesive made from the swim bladders of sturgeon as well as other fish (in North America, hake or cod). It is transparent, colorless and a very strong adhesive. ** Cross-linking is a chemical reaction that links neighboring polymer chains to each other. The result, in the case of paper, is a decrease in flexibility and therefore increased brittleness. CARDON, Dominique. Natural Dyes: Sources, Tradition, Technology and Science. 2007. London: Archetype Publications. DANIELS, Vincent. “The Chemistry of Iron Gall Ink”. The Iron Gall Ink Meeting: 4th & 5th September 2000, the University of Northumbria, Newcastle upon Tyne : postprints. Ed. A. Jean E. Brown. 2000. Newcastle upon Tyne: Conservation of Fine Art, University of Northumbria, 31-36. DORNING, David. “Iron Gall Inks: Variations on a Theme that can be Both Ironic and Galling”. The Iron Gall Ink Meeting: 4th & 5th September 2000, the University of Northumbria, Newcastle upon Tyne : postprints. Ed. A. Jean E. Brown. 2000. Newcastle upon Tyne: Conservation of Fine Art, University of Northumbria, 7-12. JAMES, Carlo. “The Evolution of Iron Gall Ink and Its Aesthetical Consequences”. The Iron Gall Ink Meeting: 4th & 5th September 2000, the University of Northumbria, Newcastle upon Tyne : postprints. Ed. A. Jean E. Brown. 2000. Newcastle upon Tyne: Conservation of Fine Art, University of Northumbria, 13-22. KREKEL, Christoph. “Chemistry of Historical Iron Gall Inks”. International Journal of Forensic Document Examiners. 1999. 5: 54-58. Merrifield, Mary P. Original Treatises, Dating from the XIIth to XVIIIth Centuries on the Arts of Painting, in Oil, Miniature, Mosaic, and on Glass; of Gilding, Dyeing, and the Preparation of Colours and Artificial Gems; Preceded by a General Introduction; with Translations, Prefaces, and Notes. 2 vols. London: J. Murray, 1849. REISSLAND, Birgit. “Visible progress of paper degradation caused by iron gall inks”. The Iron Gall Ink Meeting: 4th & 5th September 2000, the University of Northumbria, Newcastle upon Tyne : postprints. Ed. A. Jean E. Brown. 2000. Newcastle upon Tyne: Conservation of Fine Art, University of Northumbria, 67-72. STIJNMAN, Ad. 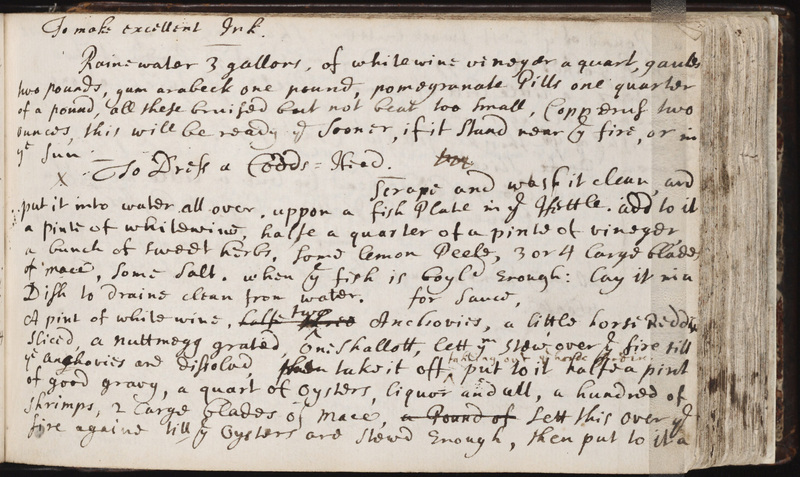 “Historical Iron-gall Ink Recipes. Art Technological Source Research for InkCor”. PapierRestaurierung. 2004. Vol. 5, No. 3: 14-17. STRLIC, Matija, KOLAR, Jana. Iron gall inks: On manufacture, characterization, degradation and stabilization. 2006. Ljubljana: National University and Library. Is it possible to neutralize the sulfuric acid after making the ink? After viewing the Getty’s exhibition on medieval manuscripts, I thought it would be great to try making iron gall ink as a homeschool project. However, I didn’t figure on sulfuric acid. To neutralize the sulfuric acid add a little of DOLOMITE (calcium carbonate). If used dolomite caution for exothermic reaction. The ink will remain like a “black soda”, which is fun. I love old world manuscripts, old world handmade paper with ragged edges, and stone buildings, walks, and many other reminders of old world. El carbonato de calcio se puede suplir por cascara de huevo molida( polvo en mortero) y después de 7 días filtrar todo para envasar en frasquitos etiquetados . Hello I am so excited I found your blog, I really found you by error, while I was researching on Aol for something else, Nonetheless I am here now and would just like to say kudos for a remarkable post and a all round thrilling blog (I also love the theme/design), I don’t have time to go through it all at the minute but I have bookmarked it and also added your RSS feeds, so when I have time I will be back to read a lot more, Please do keep up the excellent work.